The queen is the strongest piece on the board; it has the greatest value of all the pieces. You can see the initial positions of the two queens in the image below. Notes that the queen is always placed in its original position on a square of its own color. That means that the white queen will be placed on a white square and the black queen on a black square. 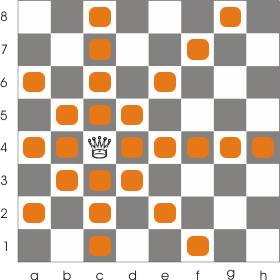 The queen is considered the most powerful piece on the table due to its great mobility and also because it can control and attack pieces and squares found on its range of action (which is quite large as you can see in the image below). It can move along ranks, files and diagonals any number of squares without being able to jump over pieces. If it finds an enemy piece in its path it can capture that piece by taking its place. You can see in the game above that the queen range of action is diminished by some enemy pieces and by its own pieces. 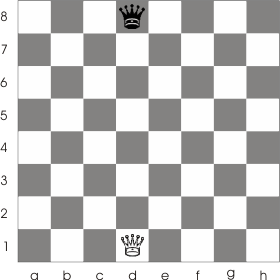 The queen can capture the knight at b5 or the pawn at f7 by taking their place. 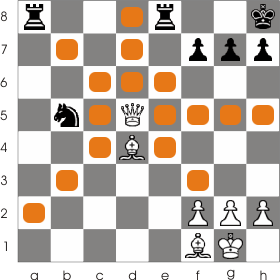 It could also capture the rook from a8 but that would be unadvised because a8 is under the protection of the e8 rook.